Notes: Villa de la Chantrerie is a mansion built in the nineteenth century, located in Nantes, on the left bank of the Erdre, Gachet road, in the district Erdre Nantes, France. The building was listed as historical monuments in 1997. The Chantry is a large agricultural area when the architect Étienne Blon acquired it. He collaborated with his brother, François-Léonard Seheult, to built a first home. In 1825, the house of the body is completed. In 1831, the daughter of Stephen Blon, Anne-Louis Levesque wife Clemence, son of the mayor of Nantes Louis-Hyacinthe Levesque. It had built the chapel in 1836, then in 1860, he had enlarged the house of his father by giving it a floor1. In 1872, the landscaped park surrounding it is designed by Dominique Noisette2 (nephew of Louis Claude Noisette), who also designed the Procé park and held the head gardener station the botanical garden of the city of 1835-1839 . 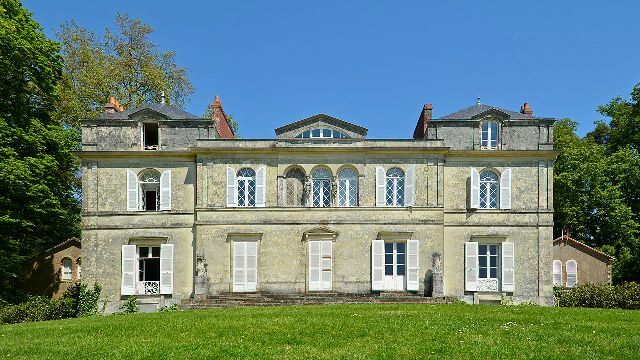 The villa and its grounds belong to the Drouin family (which includes owners of the eighteenth century and transport entrepreneurs of the twentieth century) 3 when acquired by the city of Nantes in 1972. The villa, pavilions around him, the Orangery, part of the park and chapel are enrolled in the supplementary inventory of historic monuments by order of 20 May 1997.